Maybe it’s the unremarkable visit to the grocery store that sparks an idea for a new project. Or the stultifying job that drives frantic art-making at night. Sometimes, unexpected places prove crucial to the artistic process, be it in the inspiration, the making of, or both. As part of our periodic questions to artists about their work and lives, we asked: Has a surprising or unusual locale ever proven a boon to your art-making? Several readers have asked whether I wrote my memoir, The Point of Vanishing, which is about living in solitude in northern Vermont, while I was living in solitude in northern Vermont. I didn’t. I wrote it mostly in a house just outside of Boston, in my apartment on the third floor, in a room facing a busy street, the windows closed against the noise of deliveries at the local taqueria, and the blinds closed against the sun. Readers tend to find this image, rather than the romantic one of a writer at a rough-hewn desk overlooking the mountains, disappointing. But the outpost that inspires writing isn’t necessarily conducive to it. To write, it helps me to be in a place that doesn’t call for my attention — to be above a street I can easily forget and then easily return to, to be in a place whose grandeur is less than that of the place I’m writing about. Of course, it helps to have traveled back from a place, like the northern Vermont woods, that I can’t help but remember. I am not a morning person. I have visions of my someday self awakening with the sunrise birds and blissfully churning out pages with a cup of steaming tea… yeah, nope, that’s not me. I will stay up until 3am and then sleep until 1pm if you let me. I try not to let me, because of weird stuff like human relationships and day jobs. I am, however, an airplane person. I remember as a kid staring for hours out the tiny windows, making up stories about the towering clouds’ lives. I love the whoosh of takeoff, the stomach-scramble of turbulence, the patchwork of little lives laid out below. Unfortunately, given that I’m also an artist on a tight budget, I most often end up on airplanes that leave very early in the morning – cranky, disheveled, exhausted. These seats are not a bed. The air smells recycled. Nothing is beautiful or inspiring. Put that window down, I’m trying to sleep. So imagine my surprise when I discovered by accident that crack-of-dawn air travel seems to be the exact cocktail I need to write more prolifically than I ever do while grounded. Something about being suspended in a fragile metal wing-can miles above my planet makes me believe that anything I make while in that space won’t be too significant—and somehow that short-circuits my usual loop of procrastination and perfectionism, and I land with a journal full of decently usable and sometimes even funny scenes. I wish airlines had writers’ residencies. 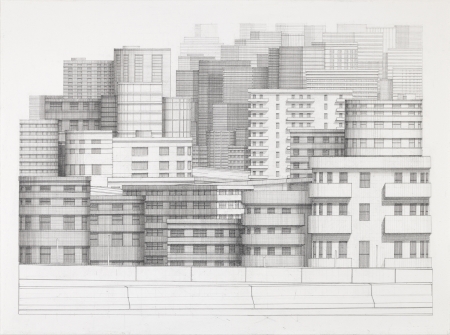 My drawings are studio fictions but much of the catalyst for this grew out of my time living in Boston’s South End, on the edge of all the construction that was taking place there at the time. Even though my work doesn’t document a specific place and depends on collections of information from many places, the qualities of that landscape informed much of my work and still does to this day – the diffused light, the compression of forms, and the manner in which the city seemed to reinvent itself on a daily basis. In that environment, it was easy to experience extreme change – from the open horizon of the sea, to the congestion of the city. In addition, over time, as the landscape became more fused with construction, it developed a very muscular ability to redirect and alter progress and perception as one traveled through it. Eventually, I came to view the city more as an equation of division and accumulation, reflecting shifts in aesthetics, politics and necessity. To this day, my drawings are still influenced by that time and like that environment, I continue to see them as equations in the process of defining themselves. 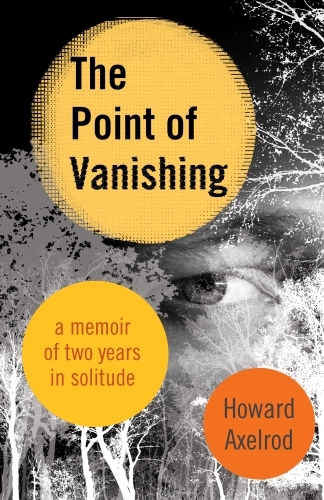 Howard Axelrod is the author of the memoir The Point of Vanishing: A Memoir of Two Years in Solitude. His writing has appeared in the New York Times Magazine, Shambhala Sun, and the Boston Globe, among other publications, and he has taught at Grub Street in Boston. Stephen Mishol is a visual artist who teaches at the University of Massachusetts-Lowell. He has received Mass Cultural Council fellowships in both Drawing & Printmaking and Painting and is represented by Miller Yezerski Gallery in Boston. Cecelia Raker is a 2016 PlayLab Fellow with Company One Theatre in Boston. Her play “La Llorona,” which recently received an Honorable Mention on the 2016 Kilroys List, will have a reading at Company One on July 24. The play will go on to have a workshop at Fresh Ink Theatre in September, with a full production planned for May ’17.